Two Russian cities shared the dubious honor of being included on a list of the world’s 10 most polluted cities, according to a report jointly published by the US Blacksmith Institute and Swiss-based Green Cross said earlier this week. The report, entitled “The Top Ten Toxic Threats: Cleanup, Progress, and Ongoing Challenges” analyzed the top 10 most polluted cities on Earth based on a variety of pollution sources and contaminants like hexavalent chromium from tanneries and heavy metals released from smelting operations. The group’s last report on the world’s top 10 polluted places was released in 2007. The authors of this year’s report said that significant progress has been made at many of the original top 10 sites. But not in Russia, where two cities that made the 2007 list remain on it six years later. The Russian industrial town of Norilsk – in northern Siberia – weighed in heavy for excess copper and nickel concentrations in soil within a 60-kilometer radius of the industrially-formed town. The town is host to the industrial giant Norilsk Nikel. Norlisk Nikel’s daugher company, the Kola Mining and Metallurgy Company (KMMC), which is located a mere 7 kilometers from the Norwegian border, has long been a sore spot between Oslo and Moscow for the KMMC’s sulfur dioxide emissions and other heavy metal contaminats that migrate into Norway from smelting operations there. According to Bellona adviser Larisa Bronder, an expert on pollution produced by the KMMC and Norilsk Nikel, some 100,000 tons of sulfer dioxide and other heavy metals waft into Norway from the Kola Peninsual facility. Though dialogue since the fall of the Soviet Union has gone some ways toward mitigating this pollution, it still remains a thorn in the side of Russian-Norwegian relations, and negotiations are delicate. Often, Russia will fire press sallies against Norway and other Northern European countries, saying the pollution flows in the opposite direction. Norilsk’s smelting operations – according to a statement accompanying the release of the Blacksmith and Green Cross report – discharge some 500 tons of copper and nickel oxides per year and release another 2 million tons of sulfur dioxide into the atmosphere annually. 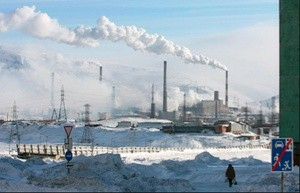 The joint report said Norilsk’s pollution contributes to free-falling life expectancies, which are 10 years bellow Russia’s national average, because of respiratory diseases, and cancers of the lung and digestive tract caused by the concentration of heavy metals and sulfur dioxide. Russia’s second city in pollution is Dzerzhinsk, 400 kilometers east of Moscow, and a former site of the Soviet Union’s chemical weapons production complex, responsible in its time for producing phosgene and mustard gas. The Blacksmith-Green Cross report cited that about 300,000 tons of chemical waste have been “improperly land filled” around the city during a period of more than six decades spanning from 1930 to 1998. The report said 190 chemicals had been released into groundwater surrounding the town, and that high concentrations of phenol in the air has increased incidences of lung, kidney and eye .cancers. Of other countries listed, Indonesia, like Russia, boasted two of the world’s most polluted cities – Citarum River and Kalimantan. Kabwe, Zambia was the other city, aside from Chernobyl, that occupied the Blacksmith and Green Cross list of the world’s most polluted cities with Norilsk and Dherzhinsk in 2007.